One of the best memories that most people have of childhood is recalling games of “Let’s Pretend!” As an adult, is there anything better than watching a child pretend to be a fairy, a princess, a knight, or even a scuba diver? This pretend play is very important to a child’s social and cognitive development. Using imagination, children can also explore positive and negative feelings without the worry of a real-life situation. In Soap Bubble Magic by Sara Bormolini, Aiden is the only one without magical powers in a family of fairies. One day, he pretends to make magic of his very own from soap bubbles in the bathroom sink. But when he accidentally uses a real magical item, his soap bubble magic has disastrous effects! Children will love the humor in this story, and reading about Aiden’s imagination will surely inspire magical thoughts of their own. Research has shown that children who engage in conversation regularly or who listen to stories on a daily basis are the ones most likely to engage in pretend play. Let stories like Soap Bubble Magic help you open the door to a whole new world of imagination in your child! Everyone in Aiden’s family has magical powers. Mommy is the Fairy of the Seven Winds. Granny is the Wise Fairy of the Crystal Waterfall. And big sister Anna is the Raindrops Fairy. But Aiden has no magical powers. What will happen if he tries to make a magical potion? Kirill is upset after getting a bad grade, so his teacher gives him a chance to improve it. He just needs to gather leaves from a forest. 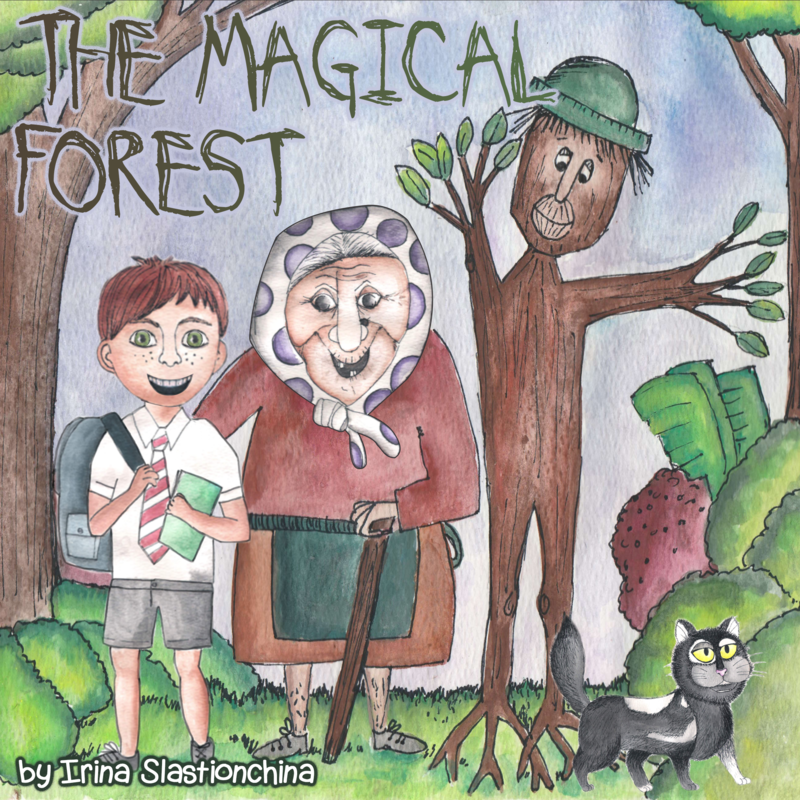 It seems like an easy task until Kirill gets lost and discovers that the forest is more than it seems! What lessons will Kirill learn? Misha and his father are going to a special toy store. Misha thinks that the toys are magical, but Dad has a surprise for him. There is magic to be found at Children’s World, but it isn’t found in the toys. What could it be? Today Leo is going to visit the Colosseum in Rome, Italy with his beloved granddad. He has heard many stories about the ancient Romans, and he can’t wait to see the Colosseum. If you have always wanted to learn more about Ancient Roman, this is the book for you! Otto is an elf who loves to create shoes, but it’s hard to find the right supplies to make them. Otto wants to go to the human world to find new materials, but shoemakers are not allowed to leave the elf world. Will Otto ever find his way there? Lucia is a little girl who wishes that she could be a fairy. When magical glitter takes her to the fairy kingdom, her wishes come true! Lucia arrives there just in time to help a fairy named Violetta find the Fairy Queen’s ring. Will she find it? This little boy wants to be an animal. But not just one! He wants to be a lot of different animals. One animal he’d love to be is a bird. Can you guess why? A special box has been delivered to Mommy. Maddie and Maddox wonder what could be in it. Mommy says there is treasure inside. What could the treasure be? Margherita and her mom are going on a boat ride across Lake Iseo in Italy. When something in the water catches Margherita’s eye, she calls her mom to show her. What is the mysterious animal in the lake? Sara Bormolini was born in Como, Italy and spent her childhood between her hometown and the Alps of Livigno. Being on the move gave her a passion for traveling and a taste for new places and cultures. She’s studied in Milan, Birmingham, and Venice, and has been living in the UK after completing her master’s degree in Children’s Literature at Cambridge. Cat lover and picture book enthusiast, Sara now lives in Oxford, where she enjoys the local eateries, the theater scene, and long hours playing board games. She is a member of the Society of Young Publishers, and she has been working as a children’s literature editor at TRP since 2014.